HAVE YOUR CAKE & EAT IT TOO! We offer the highest quality outdoor ripstop hammock at an affordable price! We designed and created our large hammock (11' x 6.6' feet) with a premium quality tear resistant, parachute nylon. Our hammocks could not be stronger (over a 600 lb limit), softer, or comfortable! 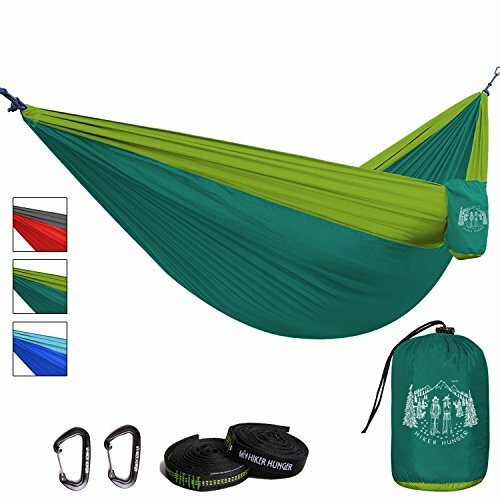 EVERYTHING YOU NEED - Tired of buying a hammock that doesn't come with the best accessories? We were too! We're not here to upsell you so we throw in our heavy duty, triple stitched tree straps and 24 kn carabiners for free! Enjoy your all inclusive hammock bundle! LIGHTWEIGHT AND STRONG - Our hammocks are super light and compact making them easy to bring along hiking, backpacking, camping, to the beach, or on any other adventure! Our hammocks are made with a quick drying, breathable material called 210T nylon resulting in longevity and a 600 lb. weight limit! HAMMOCKS FOR EVERYONE - Your kids will love our hammocks just as much as you! These are so small and perfect for traveling to the beach or park with your family or kicking back on campus in between college classes. Outdoor enthusiasts and nappers alike can relax in our affordable, spacious hammocks. You will never get a better rest then in one of our hammocks! TRYING TO DECIDE WHICH HAMMOCK TO BUY? Let us make it an easy choice! We offer an easy money back promise! If you do not like your hammock or have any issues, we will refund instantly, no questions asked! As a small family business, we make sure that all of our customers, and we mean ALL, are 110% satisfied! Don't take just our word for it! Our reputation and other products speak for themselves! We wanted to create the highest quality hammock set and offer it at a price that will not empty your wallet! That is why we include our triple stitched tree friendly straps and ultra strong carabiners for free! There is no reason you need to pay a premium price for the larger named brands. We’ve created a more comfortable hammock and offer it at half the price! We design and test our products to ensure ultimate quality. We know our hammocks are just as good as any major hammock brand out there. Have any other questions? Send us a message and we’d love to chat! Join the Hiker Hunger family! Hammock Weight limit: 600 lbs!